Typically speaking, anything with jinn tends to catch a reader’s eye. For connoisseurs of South Asian diaspora literature, anything with Kamila Shamsie also catches the eye. Put these two together and one gets the rare but brilliant short story collection The Djinn Falls in Love and Other Stories. The jinn are the most popular part of Islamic mythology, perhaps because there is very little else in the way of Islamic mythology in the first place. Westerners know them best from Hollywood incarnations such as I Dream of Jeannie and Aladdin, both of whom offer extremely unfair and inaccurate caricatures. The jinn in Islamic culture is a misunderstood creature, made with fire, never in God’s favor, always hated, always feared. The Djinn Falls in Love and Other Stories therefore fills a void in various ways. First and foremost, by creating an anthology rather than a novel, the editors have done a remarkable feat: they have offered a smorgasbord of jinn interpretations that are difficult to find in the eastern or the western world. The collection includes stories from heavyweights such as Shamsie and Helene Wecker of The Golem and the Jinni fame, as well as lesser known but no less amazing sci-fi and speculative fiction writers such as Sami Shah of Fire Boy, and the indomitable Neil Gaiman. Secondly, the collection weaves together many different genres of fiction writing. For instance Wecker brings her signature romantic touch to the story from which the book takes its name: a jinn who has converted to Islam suddenly encounters his previous lover, a powerful female jinn when he is hired to exorcise a boy. There’s also equal measures of science fiction, horror, historical, and contemporary with a twist of jinn. Perhaps the greatest example of how well the genres mesh in this collection is the futuristic sci-fi with jinn story The Jinn Hunter’s Apprentice by E. J. Swift. Humans have colonized Mars and other planets, technology is overwhelmingly advanced, and a ship on the red planet has become infiltrated with jinn. There are other sci-fi stories here, but The Jinn Hunter’s Apprentice commands attention as being the most futuristic and fantastic of them all. Thirdly, one cannot help but ponder about the importance of such a book in our current political climate. Just like jinn are often seen as one-dimensional cookie cutter characters without real emotion or challenges, so are Muslims themselves viewed in the media. Just like western (and some eastern) literature has portrayed the jinn as stereotypically bad, angry and anti-religion, so has western media portrayed Muslims themselves as violent and anti-democracy. 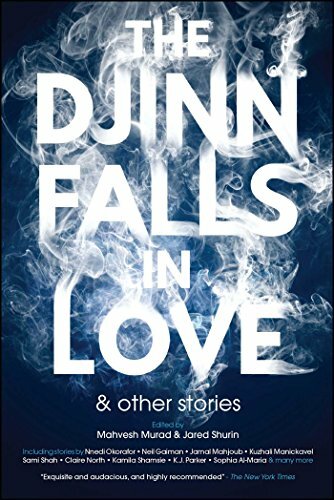 The Djinn Falls in Love and Other Stories is thus a reflection of what Muslims really are: multifaceted and flawed but also extremely diverse in thought and action and beliefs. Just like the jinn in the collection. A few stories are stellar in the range of contemporary issues they attempt to address and the finesse they do it with. In Sami Shah’s “Reap,” American soldiers using drones to spy on a village in Afghanistan watch with horror as a little Afghani girl is possessed by a jinn. Politics and war and humanity mesh so well into the story that one is left with uncertainty whether the writer actually offered a critique of American policy in Afghanistan and elsewhere, or if he merely gifted readers with a thrilling supernatural story. In both “The Spite House” (a woman forces a jinn to fulfil her evil desires) and “The Righteous Guide of Arabsat” (a man is convinced his wife is a jinn and tries to kill her) one is left to wonder whether human beings are much worse than the monsters they create in their imaginations. In other stories like “Bring Your Own Spoon” (a man and a jinn open a kitchen for poor people) and “Somewhere in America” (a man has a one-night stand with a jinn in soulless New York), we understand that jinn are also human, even though they are not technically so. They have flaws and hopes and desires, and they just want to be left alone to live their lives. So too, is it with the Muslims from whose faith the jinn mythology is derived. In this way, perhaps, this collection is not only one of short stories, but of real narratives. It will help readers see beyond the characters and plots to the cultures and people behind them. It will allow readers to think about things that may be uncomfortable or sensitive due to political rhetoric. And lastly it will let readers enter a world that they have no idea about. Even for those audiences who are already aware of, and enjoy, jinn stories, this collection offers a previously unheard of broad range to capture the imagination.